Feeling much better after a little retail therapy! The summer is almost here and for me, that can only mean one thing – it’s time to hit the Hamptons! Now truth be told, I do not have millions of dollars. 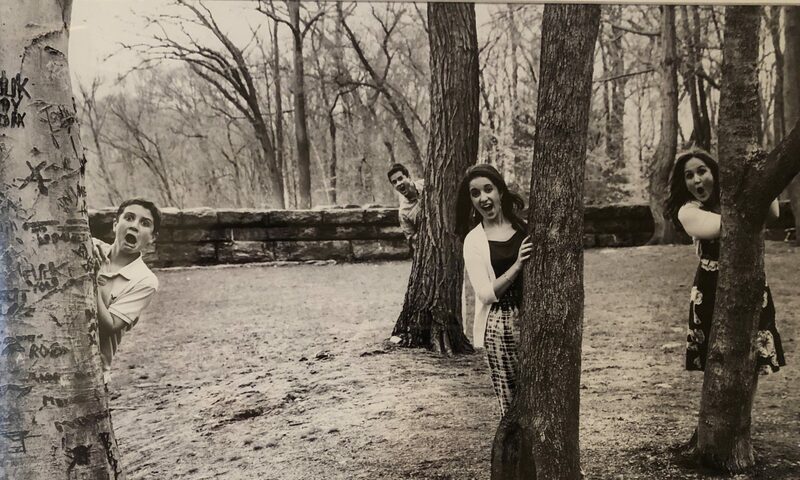 Luckily, my amazing parents, who were super smart back in the day, purchased a home in Southampton a few years before I got married and never left. That means that my husband and I have had a summer home away from home where we were able to bring our kids and our dog practically every weekend. I’ve loved getting the chance to visit my parents and one of my favorite things to do is to shop! Now for those of you who have never been to the Hamptons, the sticker shock at some of those boutiques can be daunting, but if you are a savvy shopper like me, you can track down some amazing finds in between all those ridiculous prices and come back with clothes and accessories that will have your friends constantly asking you, “Where did you get that?” So today, when one of my favorite stores was closed (I’m crossing my fingers she’s not out of business), I found another great store that just moved from Jobs Lane to Main Street that is definitely going to be my new personal fave…Therapy Life & Style. This boutique moved to a new location in Southampton. They are now at 38 Main Street and they have the trendiest tops, dresses, coverups, jeans and more and the prices are fantastic!!!!! The minute I walked into this boutique, I fell in love with all their cute tops, dresses, jeans, sweaters, beach cover ups, pretty much everything. But the best part about the store are the prices!!!! I was totally expecting to see price tags that were out of my range and thankfully, everything in the store is affordable! 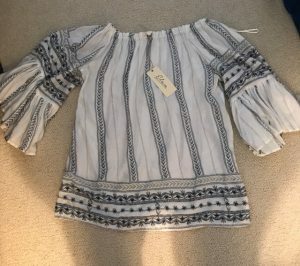 Take a look at my fabulous finds..
Love these two tops from Therapy Life & Style in Southampton – totally could have bought out the entire store! 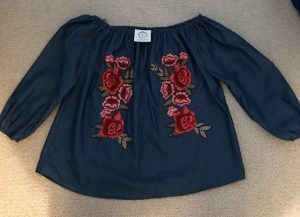 The secret is out – every summer, without fail, I find the cutest tops, skirts, dresses and summer sweaters at Piccolo Bella, a fabulous boutique located right next to my favorite furniture store, Hildreth’s. This year, we stopped by the Friday before Memorial Day Weekend and the store was closed and I was afraid they may have gone out business, but luckily, they were just getting ready for summer season and when they removed the paper in front of the windows, the results were amazing. I picked up a beautiful white silk top that will be perfect for our upcoming trip to Paris to celebrate my daughter’s graduation. 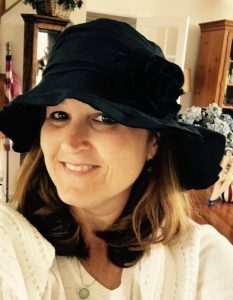 Check out this amazing new hat – super stylish in time for Paris trip! While it’s easy to spend the entire weekend strolling the streets of Southampton, there are a ton of towns to explore and one of my personal faves is Westhampton. There are even more amazing boutiques to visit and today, I discovered Chic Boutique and it was love at first sight. I picked up three gorgeous tops that are perfect for work, vacation and weekends too. And best of all, the prices are totally affordable. 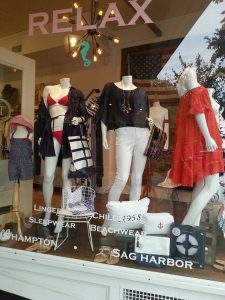 While my shopping adventure might be complete this weekend, there’s much more to come when it comes to the Hamptons. Next up…my favorite restaurants. For now, I’m going to try on my latest fashion finds! I want to start out by telling you how sorry I am that your mom was unable to realize her ultimate dream of becoming the first woman president of the United States. Frankly, I am shocked, saddened and dismayed by the outcome of the election and wanted to take the time to share that as her daughter, I’m sure you are well aware the journey doesn’t end here. In fact, for you and for your children, it has only just begun. While on a very much smaller scale, I was once in your shoes. My mom, who had spent more than 30 years as an educator in the Board of Education was up for the biggest job of her career — District Superintendent. She was immensely qualified for the job – she got along with parents, staff, people in the community and she was well liked. My mom was the ultimate worker bee who got stuff done and was a leader and team player in every sense of the word. 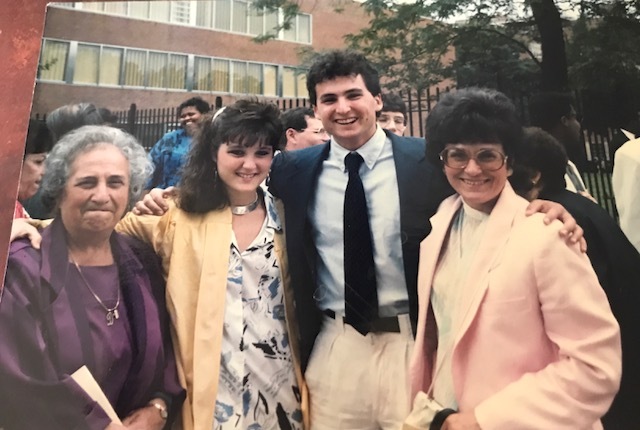 She was also valedictorian of her high school and while she didn’t pursue a career in the law (that was her first aspiration) she dedicated her life to the field of education and made a lasting impact wherever she went. She was a true role model to others and she’s the primary reason why I started Role Mommy because I wanted to encourage other women to be just like my mom – to pursue their dreams while raising a family. Celebrating my high school graduation with my grandmother, brother and mom. Working women who were always my Role Mommies. So back to the Superintendent job. The only thing that stood between my mom and that coveted position were the votes of the school board members. Unfortunately, as I came to discover during the public interview process, the school board was more interested in making a change then sticking with someone who had been part of that district for years and was an exemplary candidate for the job. Instead, they selected a man who they believed would adhere to their agenda instead of what was best for students, teachers, parents and administrators. Sadly, my mom did not get the job that would have led to the pinnacle of her career. I still remember being at that meeting with tears streaming down my face as they announced the winner and the hopes of my mom landing the job faded away in front of our eyes. While the blow was painful for her at the time, my mom persevered. She continued in her role as Deputy Superintendent and a few years later retired from the New York City Board of Education. 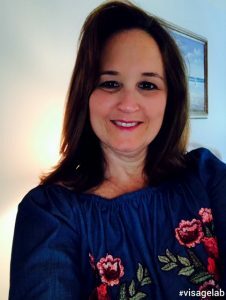 She continued to work in the private sector overseeing programs for adults with special needs and also became an adjunct professor near her home in Southampton. She volunteered at the library. She took tap dance lessons. She reconnected with old friends, and she became one of the best grandmas on the planet. My mom is now approaching her 75th birthday – just a few years older than your mom and I have to say it makes me so proud to know that she’s accomplished so much in her career and will always be a role model to me and my family. As you spend the week picking up the pieces from a hard fought campaign, I just want you to know that your mother has left us with a legacy of hope, passion and commitment to public service that we will never ever forget. She has fired up a generation of young women who are poised and ready to continue on and fight for what is right and just in our world. My own daughter will turn 18 in less than five months and she cannot wait to make her voice heard. She is the co-President of her school’s local Habitat for Humanity chapter, is a talented artist who incorporates powerful messages of feminism into her artwork and she’s a gifted speaker who is quite vocal on her views about everything from gun violence, to women and LGBTQ rights, drug abuse, and much much more. Though your mom didn’t win the election, she has won over the hearts and fighting spirits of my daughter and her friends. She will forever be a “Role Mommy” to me and a beacon for young women just starting their professional journey or those of us who are climbing that ladder while attempting to balance motherhood with our careers. I know your family will continue making our world a better place. Please know that just as we pledged to be “With Her,” we’re with you too if you ever decide to run for public office. Just so you know, we’ve got your back big time. Best wishes to you and your family and I hope the holiday season is relaxing and enjoyable for all of you. I just want you to know that we are so very grateful to your mother for her tireless efforts, her dedication and her commitment to supporting families throughout her entire career. An important reminder that life is fleeting so make every moment count.. While I usually write about lighthearted topics, I’ve decided to tackle something a bit heavy today. The reason is that a terrible tragedy took place on our block this week. One of the nicest neighbors we’ve ever had the pleasure of knowing was killed in a car accident. Although Murray was 83 years old, you never would have guessed it. He had the energy of someone 30 years his junior and was always so friendly, thoughtful and genuinely concerned about our well being. Yesterday, we attended his memorial service and what we discovered was that while Murray may no longer be with us, he touched countless individuals in his lifetime. Murray’s 22 year old grandson was incredibly eloquent when he expressed how his grandfather was one of the brightest stars in their lives and while he disappeared in a flash, his impact–much like a shooting star–will have a lasting effect on future generations. His co-workers talked about his devotion to his career and to the workers he inspired as one of the most well-respected engineers in the construction industry. A childhood friend of his sons shared how much he admired and respected “Mr. Fleisch” and reminisced about how he practically grew up at his home. But most touching of all was his friend of 71 years who, while choking back tears, told how Murray was the big brother he never had, how he sent him supportive letters while he served in the Korean War, was always there for him during some of the most difficult times in his life and how he looked forward to dining with him every Wednesday. In fact, the day he died, his friend was planning to visit Murray at his home so they could catch up on the week’s events. As tears were streaming down my face, I reflected upon the legacy Murray has left behind. He was a loving husband, incredible father, doting grandfather, a leader in his industry, a consummate friend, devoted to his faith and a wonderful neighbor. And that’s how he will be remembered. Murray was a true gentleman in every sense of the word. So now here’s your turn. How do you think people will remember you? Are you racing through each day too busy to enjoy your family, your friends and life in general? Perhaps this Memorial Day Weekend it’s time to take stock in what’s most important. I certainly learned an incredible life lesson as a result of this tragedy and know that at the end of the day, it’s about touching lives, inspiring others and being the kindest person you can be. Rest in peace Murray. You will be sorely missed.